Thanks to the rise of European-inspired Luxury Villas in Miami Beach, North America’s “Riviera” Remains an Exclusive Travel Destination. If your summers are reserved for St. Tropez, the Amalfi Coast or the Spanish islands, one of the best places to turn for some warmth during the cold winter months is Miami. The lush and vibrant city is diverse enough to offer an ideal vacation for every kind of traveller and is one of the only places in the United States able to stack up to Europe’s A-list travel spots. While the middle class may flock to the Miami they see on CSI or Jersey Shore, there is a whole other dimension to the city not readily available to most travellers. From Palm and Hibiscus Islands to South Beach and the Venetian Islands, Miami is filled with pockets of opulence and beauty that can only be fully experienced while staying in a luxury villa. If you want to experience life in Miami as it should be lived, an ordinary hotel vacation will not do. Rather, opting for your own luxury villa rental will allow for a full and true experience of the area and a vacation that will live up to all expectations. While some travellers will make a beeline for Miami tourist traps like the Bayside Market or some of the city’s overexposed and overpopulated beaches and restaurant strips, others are looking for a vacation that’s a bit more private, exclusive, and unique. Make no mistake, the city of Miami can deliver this, too. While the salsa beat hums through the heart of the city, Miami isn’t just a place full of packed nightclubs and the scantily clad, hoping to be seen. There is another Miami all about pristine stretches of private beach, lazy days maundering on luxury schooners, and endless acres of blue sky. This Miami includes exclusive enclaves on the man-made islands of Biscayne Bay, which draw billionaires and celebrities alike looking for a quiet place to enjoy some sand and relaxation. The exclusive slice of Miami draws Europeans, too, from entertainers to footballers eager to enjoy the “North American Riviera.” For these people, and others, trendy boutique hotels cannot provide the true Miami experience they are seeking, not like living in your own luxury villa can. 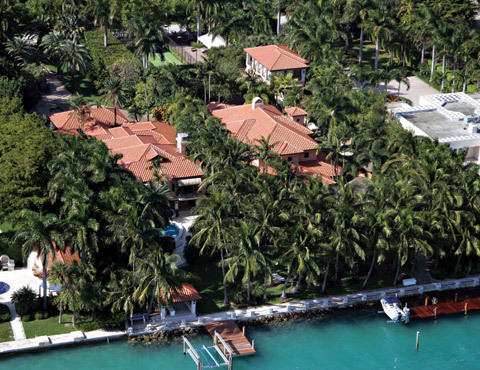 The luxury villa market in Miami is one of the most exclusive, and expensive, in the United States. For quite some time, Fisher Island — so exclusory and isolated it’s only accessible by ferry — was the most expensive zip code in the U.S. Then there are the multi-million dollar homes on Palm and Hibiscus Islands, which can only be reached by the MacArthur Causeway, and the chain of islands known as the Venetians that are perfectly located between privacy and the vibrancy of Miami proper and the hip environs of South Beach. If one would like to experience what life is like in these exclusive neighborhoods, the only way to really do so is to immerse yourself in the community and enjoy your time away at an oceanfront luxury villa that offers all the amenities of a hotel paired with the privacy and exclusivity of your own home away from home. If you want the true elite Miami experience then pack your bags and head to your own luxury villa for a vacation that can really open the doors to the true essence of life in these exclusive communities. Whether you want sailing or swimming, sunning or shopping–or all of the above–a luxury villa getaway in Miami will surely prove to be as enjoyable and exclusive as any A-list vacation spot that tried and true travel destinations like Europe may have to offer. This entry was posted on Saturday, October 2nd, 2010 at 11:52 am	and is filed under Luxury Travel, Miami. You can follow any responses to this entry through the RSS 2.0 feed. You can leave a response, or trackback from your own site.